Can we please get a proper crosswalk marking on Adeline at 24th? (and also 26th). This street is SO dangerous.people ride over 50mph, you can cross Adeline (there is even those "boats" for strollers and wheelchair) but there is no marking on the street. Therefore, cars don't yield to pedestrians. It is really risky to cross with babies, strollers, in wheelchairss We need more visibility. Floor marking and even those blinking orange light (like they have in Emeryville in front of Arizmendi) where pedestrians can push a button and it will blink orange to signal cars that pedestrian are crossing. Please make this city safe for pedestrians! OAK 311 has received this issue. Your service request ID is #885686. Please check back for status updates, or contact us directly at 510-615-5566. Agreed! 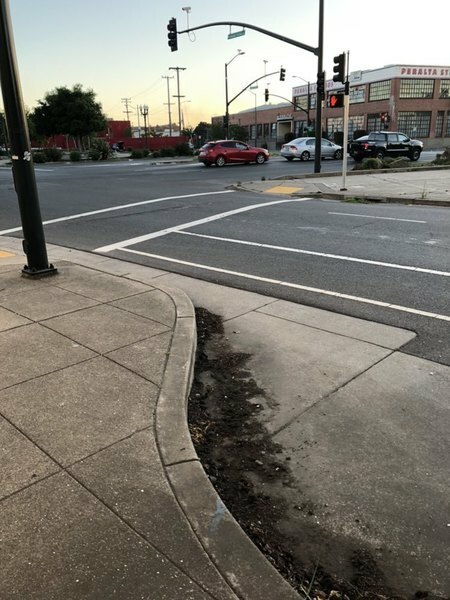 Especially with homeless encampments blocking’s the sidewalks, we need to at least be able to cross the streets safely to be able to use what parts of the sidewalks are unblocked/useable! Adeline is an unsafe traffic corridor. OAK 311 has received this issue. Your service request ID is #897473. Please check back for status updates, or contact us directly at 510-615-5566. I work at that building no matter what we do We get the graffiti all cleaned up in the next day The tag the building again, there should be with her penalties if you get caught doing graffiti. OAK 311 has received this issue. Your service request ID is #897471. Please check back for status updates, or contact us directly at 510-615-5566. Thanks City of Oakland for doing less the nothing to stop these lowlife vandals from not only costing the taxpayers hundred of thousands in abatement on public property. On private property all you do is blame the victims with fines.